محمدی, یونس, بت ‏شکنان دهکردی, محسن. (1394). تحلیل خواص وابسته به دمای تیرهای ساندویچی با رویه های هدفمند تحت بارهای موضعی. نشریه پژوهشی مهندسی مکانیک ایران, 17(1), 83-103. یونس محمدی; محسن بت ‏شکنان دهکردی. "تحلیل خواص وابسته به دمای تیرهای ساندویچی با رویه های هدفمند تحت بارهای موضعی". نشریه پژوهشی مهندسی مکانیک ایران, 17, 1, 1394, 83-103. محمدی, یونس, بت ‏شکنان دهکردی, محسن. (1394). 'تحلیل خواص وابسته به دمای تیرهای ساندویچی با رویه های هدفمند تحت بارهای موضعی', نشریه پژوهشی مهندسی مکانیک ایران, 17(1), pp. 83-103. محمدی, یونس, بت ‏شکنان دهکردی, محسن. تحلیل خواص وابسته به دمای تیرهای ساندویچی با رویه های هدفمند تحت بارهای موضعی. نشریه پژوهشی مهندسی مکانیک ایران, 1394; 17(1): 83-103. Hui, S.S., and Li, S.R., “Postbuckling of Sandwich Plates with FGM Face Sheets and Temperature-dependent Properties”, Composites: Part B, Vol. 39, pp. 332–344, (2008). Zhao, J., Yanzheng, L., and Xing, A., “Analysis of Transient Thermal Stress in Sandwich Plate with Functionally Graded Coatings”, Thin Solid Films, Vol. 516, pp. 7581–7587, (2008). Frostig, Y., and Baruch, M., “Localized Load Effects in High-order Bending of Sandwich Panels with Flexible Core”, J. Engr. Mech, Vol. 122, No. 11, pp. 1069-1076, (1996). Khalili, S.M.R., and Mohammadi, Y., “Free Vibration Analysis of Sandwich Plates with Functionally Graded Face Sheets and Temperature-dependent Material Properties: A New Approach”, European Journal of Mechanics A/Solid, Vol. 35, pp. 61-74, (2012). Allen, H.G., “Analysis and Design of Structural Sandwich Panels”, Pergamon Press, London, (1969). Plantema, F.J., “Sandwich Construction”, Wiley, New York, (1966). Zenkert, D., “An Introduction to Sandwich Construction”, Chameleon Press Ltd, London, (1995). Vinson, J.R, “The Behavior of Sandwich Structures of Isotropic and Composite Materials”, Technomic Publishing Co. Inc, Lancaster, (1999). Noor, A.K., Burton, W.S., and Bert, C.W., “Computational Models for Sandwich Panels and Shells”, Appl. Mech. Rev, Vol. 49, pp. 155–199, (1996). Librescu, L., and Hause, T., “Recent Developments in the Modeling and Behavior of Advanced Sandwich Constructions: A Survey”, Composite Structure, Vol. 48, No. 1, pp. 1–17, (2011). Mindlin, R.D., “Influence of Transverse Shear Deformation on the Bending of Classical Plates”, J. Appl. Mech, Vol. 8, pp. 18–31, (1951). Reddy, J.N., “Energy Principles and Variational Methods in Applied Mechanics”, Wiley & Sons, New York, (1984). Petras, A., and Sutcliffe, M.P.F., “Indentation Resistance of Sandwich Beams”, J Composite Structure, Vol. 46, pp. 413-424, (1999). Frostig, Y., and Baruch, M., “A High Order Theory for the Bending of Sandwich Beams with a Flexible Core”, J. ASCE, EM Division, Vol. 118, No. 5, pp. 1026–1043, (1992). 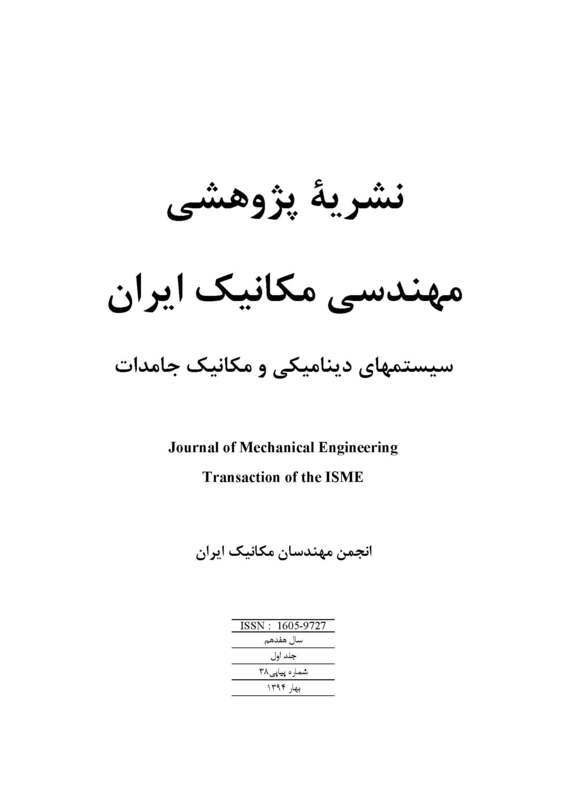 Mohammadi, Y., and Khalili, S.M.R., “Effect of Geometrical and Mechanical Properties on Behavior of Sandwich Beams with Functionally Graded Face Sheets under Indentation Loading”, J. Materials: Design and Applications, Vol. 225, pp. 231-244, (2011). Touloukian, Y.S., “Thermophysical Properties of High Temperature Solid Materials”, McMillan, New York, (1967). Malekzadeh, K., Khalili, S.M.R., and Mittal, R.K., “Local and Global Damped Vibrations of Sandwich Plates with a Viscoelastic Soft Flexible Core: An Improved High-order Approach”, J. Sandwich Structure Mater, Vol. 7, No. 5, pp. 431–456, (2005). Chi, S.H., and Chung, Y.L., “Mechanical Behavior of Functionally Graded Material Plates under Transverse Load-Part I: Analysis”, J. Solids and Structures, Vol. 43, pp. 3657-3674, (2006). Mindlin, R.M., “Influence of Rotary Inertia and Shear on Flexural Motions of Isotropic Elastic Plates”, J. Appl. Mech., Vol. 18, pp. 31-38, (1951). Malekzadeh K., Khalili, M.R., Olsson. R., and Jafari, A., “Higher-order Dynamic Response of Composite Sandwich Panels with Flexible Core under Simultaneous Low-velocity Impacts of Multiple Small Masses”, J. Solids and Structures, Vol. 43, pp. 6667-6687, (2006).